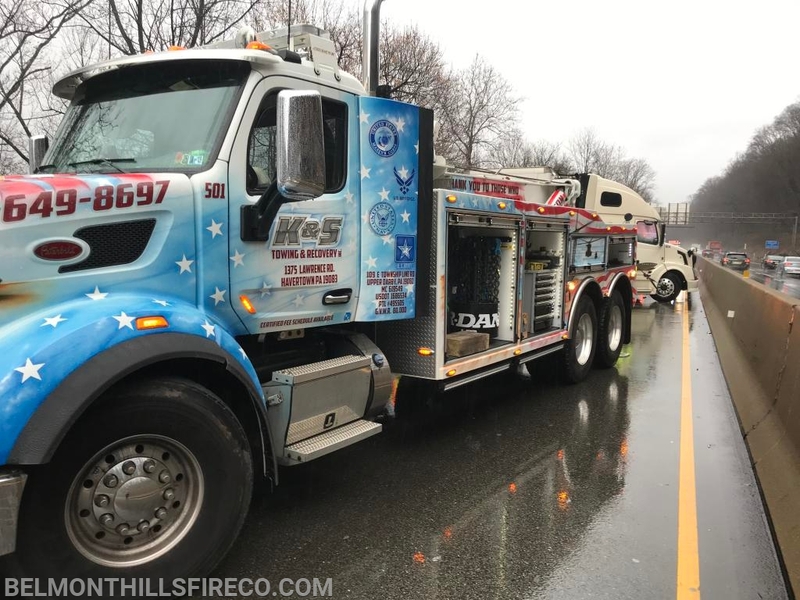 A busy Thursday for Belmont Hills Firefighters started just after 7AM when the company was dispatched for an accident at 338.1 Eastbound on the Schuylkill. Firefighters assessed the scene and worked to clear the roadway. 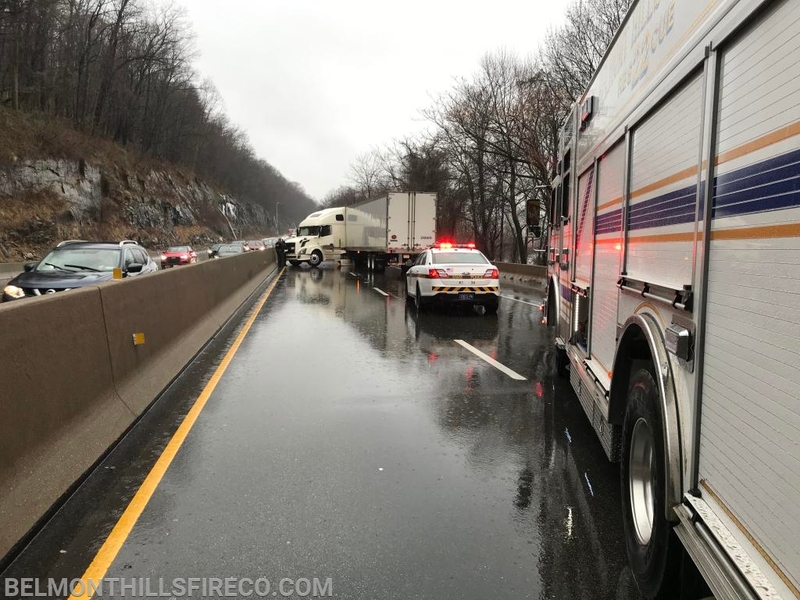 At 1:06PM the company was dispatched to 332.6 Westbound for a jackknifed tractor trailer. Firefighters worked for 2 hours and closed the roadway while the tow recovery company worked to right the vehicle and clear the road. While on the highway, a fire alarm was received on the 300 block of Tower Lane. Neighboring Gladwyne Fire Company was dispatched, and a nearby fire marshal determined the alarm to be false. 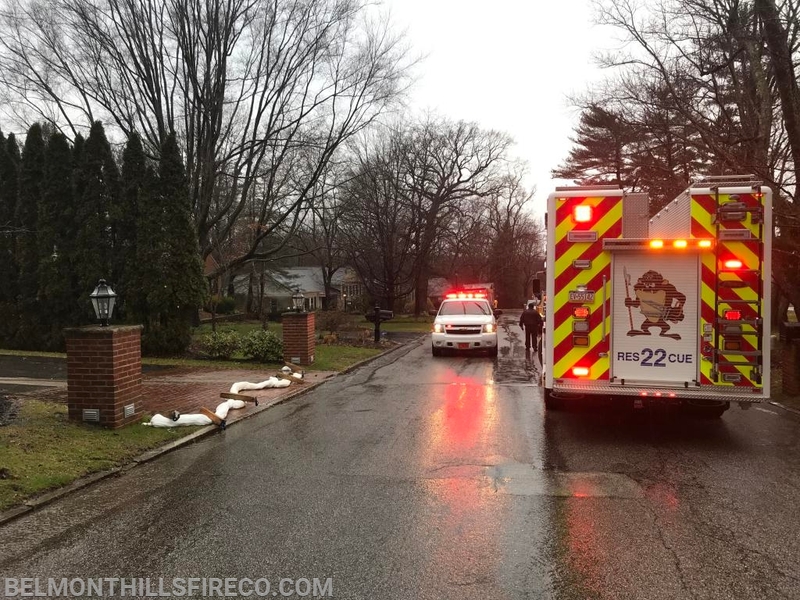 Just 2 minutes later a Hazmat was recieved on the 200 block of Tower Lane for an oil leak. Gladwyne Engine 24 (responding to the previous alarm) redirected to this call, and help was also called from Narberth Fire Company. Rescue 22 cleared the highway call and responded here. Once on scene, firefighters worked to contain the oil leak and the township helped with a sand truck. K&S Towing working to recover the TT. Firefighters containing the leaking oil.